My kids really seem to like the slight 'crunch' of the little black seeds. Oh my gosh! Yup, its very simple and it sounds so good! I have a huge pan of veggies roasting right now and I wanted something creamy to go along with it. Thank you! I have a feeling this is going to be a "go to" favorite. I've been looking for more ways to use Tofutti sour cream! Love the stuff but rarely see recipes that call for it. Thanks! How interesting! These are so different from the poppy seed noodles served here in Germany, Austra, and Eastern Europe which are sweet and made from potatoes. 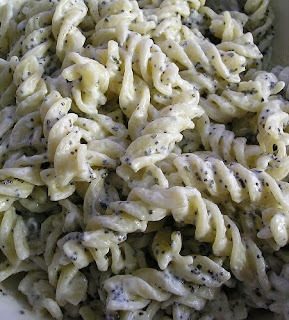 Thank you for the recipe, I love everything with poppy seeds and will try these. Thank you T N S! My Mom loved them..well, we all loved them, but she has Alzheimer's and its sometimes a struggle to get her to eat. She ate two helpings. Woo Hoo!